Dry Ice Hash Keif Making Bags Discounts Apply ! 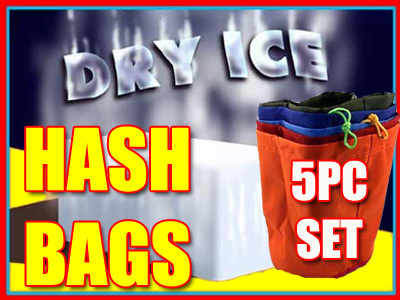 Full 5 PC set of dry ice bags - for making dry ice hash in a flash . We will send you 5PC - 5 gallon bags with side walls Micron sizes include -220-190-160-110- and 90 . Dry ice is very inexpensive and you can find it in your local town just check under the yellow pages under dry ice . Dry Ice Hash Keif Making Bags sooooo FAST! I watched the videos and couldn't wait to try the Dry Ice extraction. I got my Wacky bags in a little over a week and tried them that night. Great Product+Great Price= one very Happy Dan!